Mode of occurrence: Ovoid pebbles and cobbles (En Lachat), small parallelepipedal blocks (Champ Bottu). Cortex: Rolled neo-cortex, smooth and thin (<1 mm), grey (En Lachat); thin smooth or pitted neo-cortex, stained dark brown-grey (Champ Bottu); transition always sharp. Colour: Light brownish grey (2.5Y 6/2) to grey (2.5Y N5/) at En Lachat, yellowish brown to brownish yellow (10YR 5.5/6) at Champ Bottu. Pattern: Spotted, bordering on mottled (large clasts, recrystallization haloes). 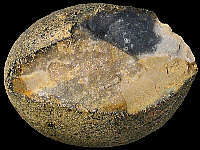 Appearance: Basically homogeneous material with a medium lustre, semi-opaque, moderately smooth, medium to fine-grained. Grains: 12.5 to 15 %, pale and shiny, rounded and irregularly shaped, poorly sorted (250 to 1000 µ, max. 3 mm). 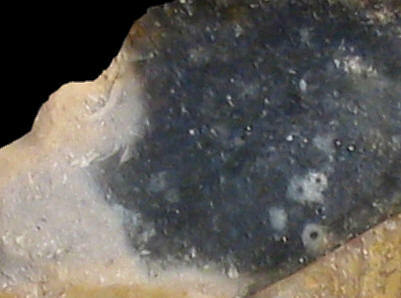 Grain composition: Numerous thin bryozoans (section 500 µ), highly fragmented, echinoderm tests, sponge spicules, rare small globose foraminifera; grains of glauconite. 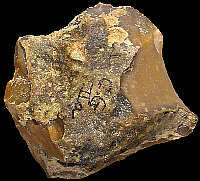 Other types of flint: The flint here constitutes quite a mixed lot, with predominantly Late Cretaceous material like CE1a, CE1b, CE1c, CE2, CE3, CE4b, and CE5, but also Hauterivian (Early Cretaceous) material of the Ht3-type.